Rocky Mountain spotted fever (RMSF) is caused by the bacterium Rickettsia rickettsii and in Florida is transmitted primarily by the American Dog Tick (Dermacentor variabilis). In the southern United States, other rickettsial organisms have been identified that cross-react with tests for Rickettsia rickettsii. These include Rickettsia parkeri and Rickettsia ambyommi. It is speculated that some of the less severe cases of RMSF may be caused by one of these organisms. More information is available at our R. parkeri page. Symptoms typically begin 2 to 14 days after a tick bite, and can initially include fever, headache, chills, vomiting, muscle aches, and lack of appetite. Later signs include stomach pain, joint pain, and diarrhea. The characteristic red non-itchy rash may first appear 2-5 days after onset of fever on the wrists and ankles, progress to the palms and soles, then the arms, legs, and trunk. However, a rash appears in 90% of RMSF cases; some people experience no rash at all. RMSF can be difficult to diagnose because many of the symptoms are non-specific. It is important to tell the physician about any tick bites that have occurred. Cases detected early in the course of disease can be easily treated with antibiotics. If a physician thinks that a person has RMSF, it is recommended that treatment begin right away, without waiting for laboratory results. Cases detected later in the course of illness are more likely to be severe and require hospitalization. In the past, the disease would kill up to 30% of those infected. With current treatment, approximately 0.5% of the people who become ill with RMSF die from the disease. The elderly, American Indians (particularly men), and chronic alcohol abusers may be at increased risk for severe disease. Ticks become infected either by feeding on rickettsemic small mammals that amplify the bacteria or transovarially (from infected female to progeny). The tick can then infect a human or animal during a subsequent feeding. Humans are considered accidental hosts and are not part of the natural transmission cycle. Dogs are also susceptible to infection. Studies have shown that the tick needs to be attached to a person for at least 6-20 hours to effectively transmit the infection, so it is important to regularly check for ticks and remove them right away. RMSF is only found in the western hemisphere. In the United States, the areas of greatest incidence are the southeastern and south central regions of the country. Nationwide, the average annual incidence increased during the last decade, from less than 2 cases per million persons in 2000 to over 6 cases per million in 2010, with large variability between years. It is likely that many more cases go unreported. In Florida, the reported incidence has increased markedly in recent years, possibly due to increased disease awareness and reporting. 163 cases of RMSF were reported from 2002 through 2011. Of these, 77% were acquired in Florida and the rest were acquired while the person was traveling in another state or country. Of the infections acquired in Florida, the majority were reported from counties in the northern and central regions of the state. Cases of RMSF/Spotted fever rickettsiosis (SFR) are reported year-round without distinct seasonality, though peak transmission typically occurs during the summer months. Warner RD, Marsh WW. 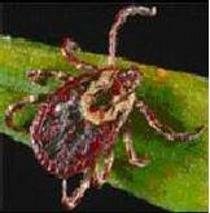 Zoonosis Update: Rocky Mountain Spotted Fever. JAVMA 2002. Dantas-Torres F. Rocky Mountain Spotted Fever. Lancet Infect Dis. 2007; 7: 724-32.